"I paint what I see in America, in other words I paint the American scene." One of America's first modern artists and a forefather of Pop art, Stuart Davis began his artistic career with the Ashcan School before embracing European modernism following the Armory Show. The artist's abstract paintings, infused with jazz rhythm and bold, colorful abstractions of New York's urban landscape or household objects, offer a taste of European Cubism with an American twist. Whether painting in the style of realism or Post-cubist abstraction, Davis's determination to convey something of American political and consumer culture was unwavering. Davis is credited with developing an American variation of European Cubism at a time when modernism was just beginning to infiltrate the country. Through slang words and imagery that were distinctly American, Davis's paintings established the country's presence in the burgeoning modern art world. The artist was one of the first to consider jazz and swing music in conjunction with painting. His use of bright, pulsating colors, expressive lines, and repetitious shapes creates a visual rhythm in his paintings similar to the syncopation and improvisation of jazz music. Davis introduced a new post-Cubist approach to abstraction by dispersing shapes, throughout the canvas and balancing bold colors in such a way as to deny a central focal point. This new method, in which all parts are equal so that the viewer's eye can wander unguided, signified an important step toward the complete abstraction accomplished by Abstract Expressionists, such as Jackson Pollock. Davis transformed common consumer products and advertisements into singular works of high art that evoked the American populist spirit, prefiguring Pop art of the 1960s. 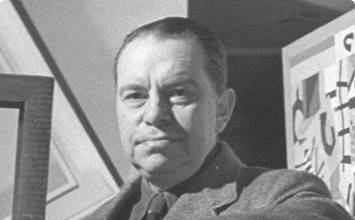 The son of sculptor Helen Stuart Foulke and art editor Edward Wyatt Davis, Stuart Davis seemed destined for a career in the fine arts. His interest in drawing was apparent by age sixteen, when he began writing and illustrating adventure stories for his brother Wyatt, thirteen years his junior. Davis's father was then the art editor and cartoonist for Newark Evening News. The family's relocation from Philadelphia, where Davis was born, to New Jersey was fortuitous for Davis's artistic development. It put him in closer contact with a number of artist-reporters who had been working with his father since the 1890s. Now known as "the Eight," these artists included Robert Henri, George Luks, and Everett Shinn. This painting, which depicts a tenement building located in New York City's Chinatown, alludes to the social realities of the city's immigrant and working class populations. A woman dressed in black confronts the viewer, offering her bodily profile for consideration. Faded advertisements mottle the stone surface of the building near the door. A barely legible sign in the window announces, "SUM YET PLEASURE," suggesting the woman's occupation to be that of a prostitute. On the balcony's rail sits an outstretched cat, traditionally a marker for promiscuity further supporting this assumption. Chinatown is distinctly different from much of Davis's mature work, which is known for its bright colors and abstract forms. Here, Davis offers an honest, objective view of the metropolis's seedy underbelly in the style of the Ashcan School. His expressive brushwork hints at the painting's hasty completion - something Robert Henri encouraged in his students. As an Ashcan artist, Davis was among the first American painters to express an interest in enlightening and educating viewers on the populist reality. During the 1920s, Stuart Davis painted table and object still-lifes that, because of the clarity of abstraction, have been designated as Cubist-Realist. Many depict tobacco products readily at hand for a smoker, as Davis smoked himself. A clear departure from his earlier, strictly realist paintings, this abstract still-life of Lucky Strike cigarettes retains identifiable patterns, textures, and lettering associated with the brand, but detaches them from their original packaging. The features of the package are rearranged on the canvas seemingly at random, reminding the viewer of the difficulty of translating a three-dimensional object to a flat canvas. The collage-like composition and color palette bring to mind the Synthetic Cubist paintings of Pablo Picasso, Georges Braque, and Juan Gris. Davis began incorporating modern art principles into his work following the 1913 Armory Show. He described the exhibition of European abstract art as "the greatest shock to me - the greatest single influence I have experienced in my work." Still, it took several years before his work evolved into the heavily abstract, brightly colored compositions for which he is best known. Lucky Strike is a testament to Davis's success applying European modern painting techniques to a distinctly American subject, thereby offering viewers an Americanized Cubist style. Like his contemporaries Charles Demuth and Gerald Murphy, Davis created modern masterpieces that call attention to American consumerism. In this case, Davis painted a newly mass-produced product - cigarettes - which by 1930 had replaced loose leaf tobacco and rolling papers. His use of a widely known brand as a subject for art anticipates the Pop art movement of the 1960s. Photographs suggest that this image likely represents Front Street and Coenties Slip in Manhattan's Financial District. The canvas is divided into two distinct views of the same intersection - what Davis called a "mental collage." A tenement building with a fire escape ladder dangling down toward the ground appears at left with a delivery truck labeled "Smith" below. "Smith" may refer to then Governor Alfred E. Smith, who was campaigning for the presidency. The view at right offers a broader perspective, with a street, a sidewalk, smaller buildings, and skyscrapers in the distance. The elevated train line arcs across the frame, supported by steel girders rendered in red beneath. The colors and shapes on both sides of the canvas are bright and chaotic, bombarding the viewer as would bright city lights and blinking neon advertisements. This rendition of lower Manhattan is a far cry from the gritty urban landscapes of Davis's paintings in the Ashcan tradition. Here, Davis seems less interested in the occupants of the tenement buildings, instead embracing the modern energy and innovations. The artist was intrigued by that manner in which technological advancements altered American life. Like many of his peers, Davis also felt that artistic style and subject matter should change to reflect that. He adored the cinema. It is possible that he deliberately designed House and Street to evoke the frames in a strip of 35mm film. This forward-looking optimism and embrace of progress typified American modernism in the works of many of Davis's contemporaries, among them Joseph Stella and Charles Demuth. While this painting is less abstract than Davis' Cubist-inspired works of the 1920s, it retains the Cubist interest in depicting multiple perspectives of the same image. House and Street also anticipates the artist's reliance on bold color and simplified shapes to articulate energy and rhythm in his mature work. In 1927, Davis nailed an eggbeater, a rubber glove, and an electric fan to a table in his studio. This unexpected combination of modern appliances reminiscent of the Dada appreciation for absurd juxtapositions became the sole focus of Davis's craft for a year. Egg Beater, No. 4 is the last in the series of four remarkably different compositions depicting the same still-life and is often described as his first truly abstract painting. Choosing to focus on unrelated objects enabled the artist to disengage with their utilitarian functions and focus on relationships between color, shapes, and space. "My aim," Davis wrote, "was... to strip a subject down to the real physical source of its stimulus." In No. 4, objects are completely disassembled and distilled into basic shapes and planes so that their forms become virtually unrecognizable. Overlapping planes and jolting colors call to mind the improvisation and rhythm of jazz music. Contrary to earlier paintings in the series, wherein the arrangement of shapes and planes suggests a depth of space, in this final work, space is ambiguous. Here, Davis offers a more cerebral approach to still-life painting - one that engages the intellect rather than the senses. The artist never considered himself a pure abstractionist, and shortly after completing this series he began reincorporating signs, text, and recognizable urban landmarks into his work. Still, he insisted that the Egg Beater series represented a breakthrough in his artistic development. He later recalled that it "enabled me to realize certain structural principals [sic] that I have continued to use ever since." Considered one of Davis's most significant works, this bold, bright mural is an abstract rendering of the waterfront in Gloucester, Massachusetts, created by the artist while visiting his parents. In Davis's own words, the setting was "the place I had been looking for. It had the brilliant light of Provincetown, but with the important additions of topographical severity and the architectural beauties of the Gloucester schooner." Davis's use of color and shape lends the work a clear sense of energy and movement, while the overlapping scenes tell multiple stories at once. The dynamism and chaotic energy of the work alludes to the disorientation of urban life. Amidst the hodgepodge of vernacular structures, colorful nautical forms reminiscent of sails, masts, and buoys, appear to vibrate as if in harmony with a musical rhythm. Often described as one of America's original art forms, jazz in particular is known for its emphasis on improvisation and disruption of regular rhythms (syncopation). Swing Landscape was initially commissioned by the WPA for display at a housing project in Williamsburg, Brooklyn. But it was ultimately rejected, likely because its jarring colors, seemingly chaotic jumble of forms, and fracturing of space into multiple perspectives were inconsistent with the more realist aesthetic expected of public art. Today the mural is celebrated as the most important American painting of the 1930s precisely because it challenged the stylistic preference of the public arts initiative. Instead of the Ashcan style that offered an unsentimental view of urban life, here Davis offers the experience of urban living. The mural brings together abstraction and realism by intermingling forms and spaces in a riotous kaleidoscope of bright, vivid color. Although it was not shown in a public space as originally intended, Swing Landscape is a quintessential example of his paintings from this period that influenced the development of both the Abstract Expressionist and Pop art movements. 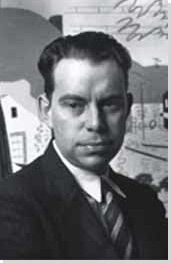 Stuart Davis was one of the first American artists to consider jazz and swing to be musical counterparts to abstract art. This painting, with its energetic shapes and Miro-esque squiggly lines buoyed by a vibrant color palette of red, black, white, yellow, orange, and blue, exemplifies this sensorial connection. Davis explained, "[It] is called Hot [a jazz term] because of its dynamic mood" akin to the energy and improvisation in jazz music. The six colors "are used as the instruments in a musical composition might be, where the tone-color variety results from the simultaneous juxtaposition of different instrument groups." These bold, pulsating colors affect an aggressive energy in imitation of the sensory overload that can accompany life in a modern city. The painting's unusual title also offers a physical location: Davis's studio on 7th Avenue in the West Village, an area known for its outstanding jazz clubs. Davis's invented term, "still-scape," is a portmanteau combining the terms still-life and landscape. Indeed, in this painting, the artist brings together forms and colors from still-lifes and landscapes of his earlier work and adds new shapes. Bright, bold lines evoke the stripes on the cement of a city street or the letters of neon signs. Round shapes suggest headlights and street signs; their vibrating colors alluding to the noisy, bustling atmosphere of New York City. Upon completing the painting, Davis commented: "It is the product of everyday experience in the new lights, speeds, and spaces of the American environment." Here, as in Swing Landscape, Davis presents a unique post-cubist concept of pictorial space by foregoing the traditional method of organizing intersecting planes and shapes around the center of the composition and instead dispersing forms throughout the picture in a manner that denies any single identifiable focal point. Colors, though bold and strongly contrasting, are balanced so that no one color dominates. In this way, the painting becomes a loosely ordered, continuous, and decorative surface with serial centers of focus. The objective coherence of the picture means that all parts are equal, contrary to the Cubist gravitation toward the center of the picture plane. Soon many younger artists, including Arshile Gorky, Adolph Gottlieb, Willem de Kooning, and Jackson Pollock, also began tinkering with their own departures from Cubism's established spatial order. This late work by Davis moves away from the sensory overload of densely crowded compositions toward a more pared down, punchy, and geometric aesthetic. A lively mix of graphic forms, text, and high-impact color, Owh! In San Paõ edges closer to pure abstraction than do some of his earlier canvases, with seemingly disembodied words and indistinct forms. Angular, planar shapes of blue, green and fuchsia intersect in the center of the canvas, evocative of billboards and posters in a manner that anticipates Pop art's fascination with imagery taken from consumer culture and advertising. Here, the fracturing, fragmentary influence of Cubism applies as much to sound as it does to sight, with the inclusion of words written in various styles each conveying distinct tones of voice. The artist's reliance on hot colors and modern slang attest to his continued love of jazz music. Later in life, Davis began revisiting earlier works and favorites motifs as bases for new images. This practice exemplifies the "continuity of pictorial themes and painting techniques" within the artist's oeuvre. This painting, for example, was initially inspired by Percolator, a painting of a coffee pot Davis created in 1927. The words "else," "used to be," and "now" could refer to the passage of time between the creation of the two paintings. Almost 25 years later, Owh! In San Paõ presents the coffee pot now reduced to a mere cylinder amidst other shapes painted in intense, lively colors. Davis had planned to exhibit the canvas at the Sao Paulo Biennial, but the work was rejected, which may help explain its title.